Shortly after meeting with House Republicans on Tuesday, Paul Ryan said he will run for Speaker of the House if certain conditions are met. Following Speaker John Boehner's decision to step down at the end of October, the House has been thrown into chaos as they struggle to find a suitable replacement. But amidst the division, Ryan has stood out as the most likely option. Despite being initially reluctant to enter the race — at one point repeatedly maintaining that he would not run — Ryan finally settled on five requirements that must be met for him to considering running. And though all will require some compromise, the most difficult requirement for Ryan to attain is the most important one: that he will have full endorsement of the party. According to a statement released by Brendan Buck, Ryan's communication director, he won't run without it. Ryan's other requests, though more achievable, are just as important to the young politician who once served as Mitt Romney's running mate. 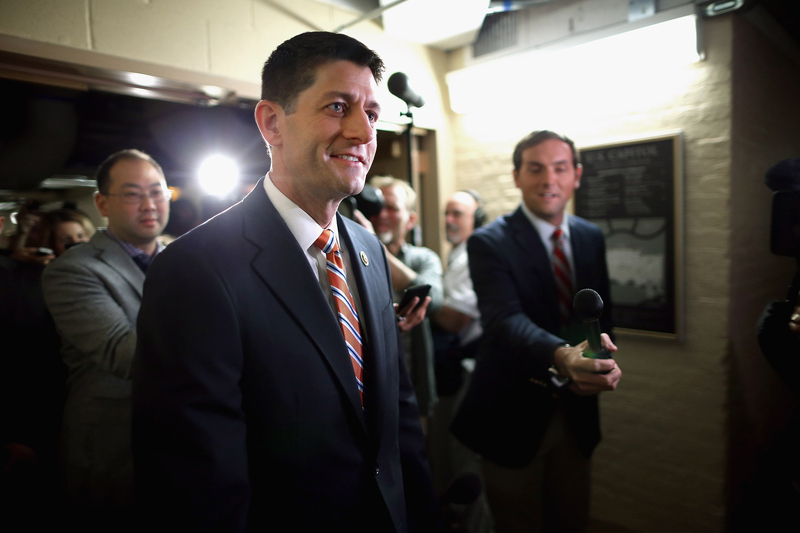 According to Ryan, he wants the Speaker to focus more on larger ideas and creating policy for the party. "Our next speaker has to be a visionary one," Ryan said. Additionally, Ryan wants to enforce a stable work-life balance. During a press conference on Tuesday night where he outlined his conditions, Ryan reiterated his dedication to his family, voicing concerns that the position could pull him away from his children. In keeping with his desire to be a unifying Speaker, Ryan stressed the importance of communal discussion when making changes to House rules. "They affect everyone, so everyone should have the opportunity for input," Ryan's statement read. But there is one change in particular that Ryan feels is crucial — to make the Speaker unimpeachable. If successful, the sitting Speaker, regardless of who wins the election, would not face constant pressure from fear of losing the position. According to Ryan, a Speaker, "cannot be successful with this weapon pointed at them all the time." This condition, paired with Ryan's desire for full backing, could force the organization and unity currently missing within the House. Constant pressure from the House Freedom Caucus — the organization that Ryan met with on Tuesday — was a part of Boehner's decision to step down. And worry over the ability to gather full support is what caused Kevin McCarthy, the house majority leader and assumed nominee, to back out of the race as well. Despite friction between the various factions within the House, Ryan was elevated as a popular choice for Speaker because many believed he would be able to provide unity and stability to the party. And, although he hasn't even announced a decision to run yet, Ryan's already getting to work. Instead of winning the Speaker position and then working to quell in the infighting, Ryan is demanding that the representatives sort themselves out first. And he's taking a big gamble on his conditions. If factions like the Freedom Caucus refuse to agree to change the impeachment rules or fully back Ryan, he'll be forced to either run anyway, or stick to his guns and refuse candidacy. If he refuses, that means drawing out the Speaker search even longer, and continuing to keep the House in chaos — something that voters may not be willing to forget come reelection season. He has effectively thrown the ball into the Freedom Caucus' court: if they don't pick it up, the blame will be on them. According to Buck, Ryan hopes to have full support from the party by Friday, and a full decision is expected by then.